L to R: Lynn Rearden, SC State Lead Ambassador for ACSCAN, Chef Bob Brawner, Beth Johnson, Grassroots Manager of ACSCAN, Mary Lou Brawner, Suzanne Hyman, Health Policy Director for ACSCAN. American Cancer Society Cancer Action Network officials were in town last Thursday to receive some funds, a donation from Chef Bob Brawner and his business, “Chef Bob’s Cafe,” as well as to announce, along with SC State Lead Ambassador for ACSCAN Lynn Rearden, the upcoming event in Columbia, SC, on the Statehouse grounds. The officials were: Beth Johnson, Grassroots Manager of ACSCAN and Suzanne Hyman, Health Policy Director for ACSCAN. This event is to bring together folks who wish to be a part of the fight against cancer. A part of the program will be a Lights of Hope Ceremony, Tuesday, March 12, 2013, on the north steps of the Capital building. Anyone wishing to place a bag, with a lighted candle inside, can do so with a $10.00 donation. 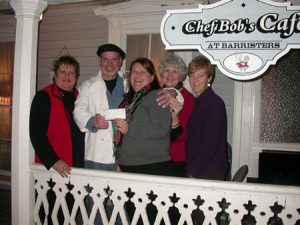 To learn more about this, one can contact Lynn Rearden (803-637-9899 or 804-614-8059). 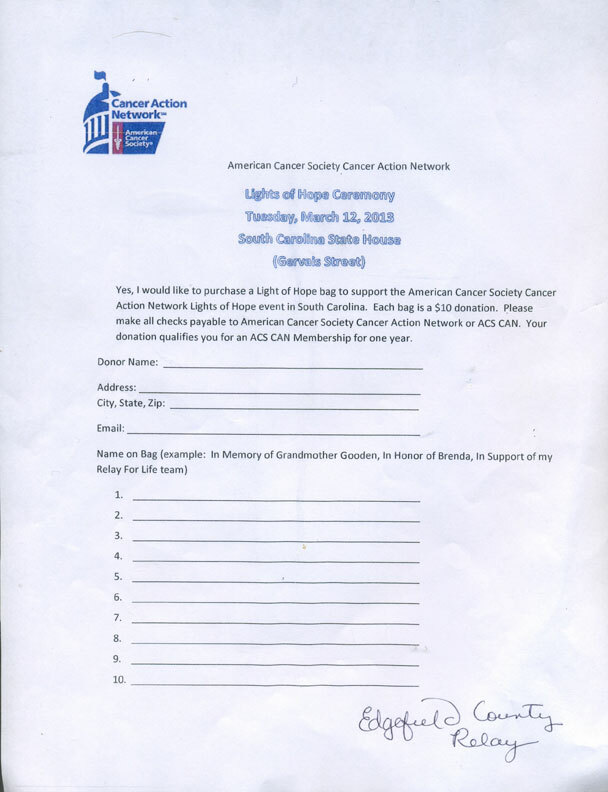 Also, one may go to ACSCAN.org/SCLightsofHope/ to see the story and a form for purchasing a light. The form may also be downloaded by clicking this link.